Daniela's Author Bio: Daniela is a tech and gadget savvy mom who thinks tech isn't just for men and can assemble and dissemble a PC faster than her husband. In 2010, the FTC recorded over 250,000 complaints of identity theft in the United States. While many identity thieves still get their information from your paper mail, a stolen purse or wallet, or hacked files online, more and more are starting to glean sensitive information from the hard drives of old computers. If you’re getting ready to toss out your desktop or laptop in favor of a newer model, take these steps to protect yourself from identity theft. What information might be stored? Not sure it’s worth all that work to wipe your hard drive? After all, you don’t keep a ton of important information on your computer, so what could a hacker possibly find anyway; and if you’re just donating your computer or selling it for cheap, what are the odds that an identity thief is going to get his hands on it? The problem with this line of thinking is that often times, your computer has stored information that you don’t even know it has stored. Common information stored on computers includes account numbers, credit card numbers, passwords, registration keys for software programs that you use, medical information, addresses, and even tax returns – which contain pretty much all the personal information necessary for a someone to apply for a credit card or bank loan in your name! Keep in mind that many identity thieves will actually buy a used computer – or even steal a donated one – in the hope of gleaning such personal information. This information can be worth thousands of dollars to them and can create a huge headache – and financial problems – for you. 1. Don’t count of just deleting the files. While you’ll want to delete the files from your computer, this is just the first step to take. Identity thieves are often experts at getting deleted information from hard drives by using specialized software. 2. Save any files you want to keep. Before you wipe your hard drive, you will, of course, want to save any files you want to keep. You can transfer your data to a new computer, burn it to a CD, put it on a USB drive, or put it on an external hard drive – a particularly good option if you need to store a ton of files or information. 3. Use a utility program specifically meant to wipe your hard drive. Local tech stores will sell utility programs meant for this purpose that match up with your specific operating system. The best idea is to get a program that will overwrite or wipe the hard drive several times instead of just once, and you’ll definitely want a program that wipes the entire drive. 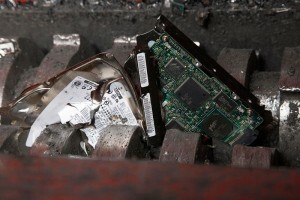 If you know your computer has particularly sensitive information on it and you don’t trust a utility program to get rid of the information, you can always destroy the hard drive physically. Businesses in particular, often use hard drive shredding services, as their computers tend to have lots of personal information on both employees and customers of the business. Once you shred the hard drive, you can simply sell or donate the rest of the computer without it, and the new owner can then completely replace the hard drive. Even if you are careful to destroy information on your computer before you sell or donate it, it’s a good idea to be wary of potential identity theft. Check your credit reports regularly to ensure that everything is accurate. Credit reports are normally the first place you’ll see evidence of identity theft when new accounts pop up that you didn’t open. If you do think you’ve been a victim of identity theft, get identity theft assistance as soon as possible. Report the problem to the credit reporting bureaus, who will place a fraud alert on your account. Then close the new, fraudulent accounts. Finally, report the fraud to the Federal Trade Commission and your local police department. If you’ve taken steps to protect your personal information from being stolen, you may never have to deal with the problem of identity theft, but it’s always a good idea to be aware of what you should do if your identity should be stolen.